ISC will be offering both introductory and advanced acting classes this spring. Sign up for the one that seems most appropriate for you, or take them both in sequence — the introductory class is perfect preparation for the more advanced scene and character study class. Space is limited in both classes. To reserve a spot or for more information, visit our website or e-mail us at info@ithacashakespeare.org. This course is intended as a general introduction to the fundamental techniques of acting Shakespeare. We'll take you step-by-step through the process of learning to read Shakespeare like an actor, finding the clues in the script to craft a performance, speaking Shakespeare effectively, approaching and breaking down long speeches, auditioning for Shakespeare, and working on a Shakespearean scene. This course is highly recommended for actors with limited experience in Shakespeare who want to audition for ISC at our spring auditions at the end of March. The majority of the work will be done during class time in this course. Required out-of-class work will be minimal. This more advanced course will take a group of actors in detail through the process of creating a character and preparing a scene in the practical, real-world context of work on a specific play. The goal is to help each actor develop a practical, repeatable process for building fascinating, lifelike characters and crafting riveting, nuanced performances from a Shakespearean script. This course would be ideal for someone who has been through our introductory course and wants to go deeper. Actors are welcome to repeat this class and work on different characters each time. Some out-of-class work will be necessary, including individual preparation and memorization and work with a partner on scenes. 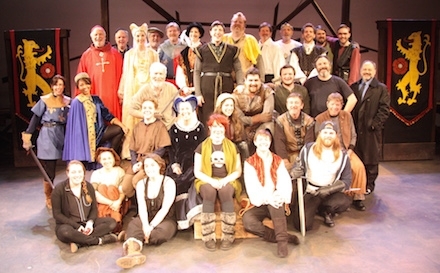 Thanks to everyone who came to see Henry V at the Hangar in February! Another great review was published in the Cornell Daily Sun. 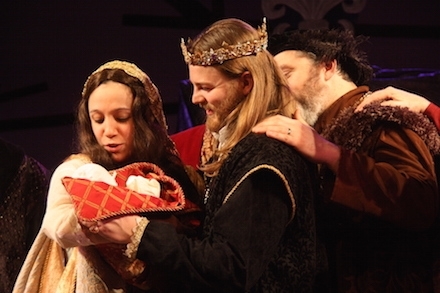 Our production ended with Henry V and Katherine holding their son, the future King Henry VI...which leads us to the next installment in Shakespeare's historical epic, Henry VI: A Tiger's Heart, coming to Cornell Plantations this summer! the scene that gave birth to the phrase "the Wars of the Roses"
a popular rebellion with the slogan "Let's kill all the lawyers!" and of course a whole lot of swordplay, speechifying, and maneuvering for the throne. The "game of thrones" heats up to boiling point in this show, so put it on your calendars now!